Picture yourself curled up in front of a roaring fire, after a long stressful day at work, or traipsing around the shops, or maybe a bracing walk over the hills with your dog – who’s snuggled up at your feet! The flames are flickering, the cushions are soft and inviting, your favourite singer is crooning quietly in the background, and your hands are wrapped around a steaming mug of hot chocolate. A perfect end to the day! We have the Aztecs to thank for the hot chocolate that caresses your mouth before slipping smoothly down to warm you from the inside out. They were the ones responsible for introducing chocolate to the Spanish back in the sixteenth century. No-one’s exactly certain but it’s likely that the cacao plant first appeared in South America as long ago as 5,000 BC, and over the centuries cacao came to be enjoyed as a drink, adored by the ancient Aztecs, who liked their hot chocolate with chilli. Place the chocolate, water, honey, salt, coffee and chilli in a saucepan and bring to the boil, stirring constantly. Simmer very gently for 1 minute. Add the milk, stir well and leave to simmer very gently until hot. Stir in the vanilla extract, remove the chilli and divide between 2 large mugs. Sprinkle with cinnamon and serve immediately. Place the chocolate and 2 fl oz water in a bowl over a saucepan of boiling water. Don’t let the base of the bowl touch the water. Use a double boiler if you have one. Heat, stirring, until melted and smooth. Remove the bowl from the pan and whisk in the remaining 3 tablespoons hot water. Heat the milk to just before boiling and pour into the bowl. Whisk well and divide between 4 mugs of heatproof glasses. Serve topped with a dollop of fresh cream and sprinkled with cocoa. Offer sugar to taste. Bring the milk, cream and zest of the orange to the boil gently. Remove from heat and stir in the chocolate until dissolved. Add a good dollop of Cointreau and sugar to taste. Remove zest before serving and serve garnished with whipped cream and sprinkled cocoa. Whisk the milk, chocolate and nutmeg together. When smooth, pour into a small saucepan and heat gently. Pour into 2 mugs and top with the marshmallows. Separate the eggs and whisk the whites until stiff. Stir the drinking chocolate into the milk and heat gently in a small saucepan. Bring to the boil and then allow to cool slightly. Beat in the egg yolks and the rum. Fold in the egg whites. Divide between 3 mugs and serve with a chocolate flake stirrer. Place the cocoa, icing sugar and milk in a saucepan and stir well. Gently bring to the boil, stirring constantly. Add the coffee and Drambuie, stir and pour into cups. Serve decorated with a dollop of cream and sprinkled with cocoa. Mix the drinking chocolate to a paste with some boiling water. Place in a liquidiser with the milk, yogurt and 1 banana. Whizz until smooth. 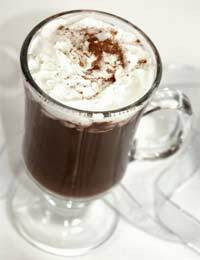 Divide between 2 glasses and decorate with sliced banana, whipped cream and grated chocolate. Mix the drinking chocolate to a paste with a little boiling water. Place in a liquidiser with the milk, banana and 1 scoop of ice cream. Whizz until smooth and frothy. Divide between 2 glasses and top each with a scoop of ice cream and ½ a flake.